Today Tel Aviv’s fast-rising star, NOGA EREZ, has premiered a striking and surreal video for “Off The Radar”. “Off The Radar” is the title track from her forthcoming debut album, released on June 2nd via City Slang. It’s not the easiest of goals, but few succeed as well as Erez. While the music she makes in collaboration with her partner and co-writer, composer and producer Ori Rousso, exploits many of the more physical, dynamic elements of electronic music, it also embraces a cerebral sensitivity that’s made her one of her home city’s most exciting, idiosyncratic artists. As inspired by Björk, M.I.A. and fka Twigs as by Flying Lotus, Kendrick Lamar and Frank Ocean, the grainy textures and potent atmospheres forged with her synths and ingenious beats bravely straddle genres, energised further by the environment in which she’s grown up. 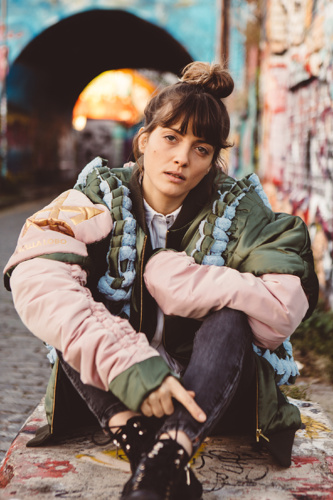 Uncompromising and unpredictable, sophisticated and bold, Noga Erez is clear about her ambitions. “Our way of trying to keep in contact with our feelings and fears, and of avoiding emotional detachment about everything, is music. Human beings can come from completely different places but share a fundamental basis of emotions. In my opinion, music is the form of art or communication that expresses that most accurately.” The conversation starts now.